Are you searching for the perfect addition to your fireplace? 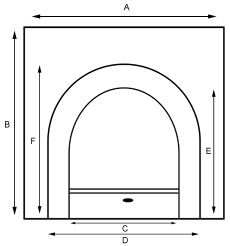 A fireplace insert that combines good looks and greater heat output and functionality? Look no further than this Landsdowne solid cast iron fireplace insert, and picture your entire family cosied up around the delightful warmth it offers during those cold winter evenings. The Landsdowne Cast Iron Insert is beautifully crafted in a highlighted black & chrome scheme. It is styled with a half polished chrome look and half is the more traditional black for great style and elegance. 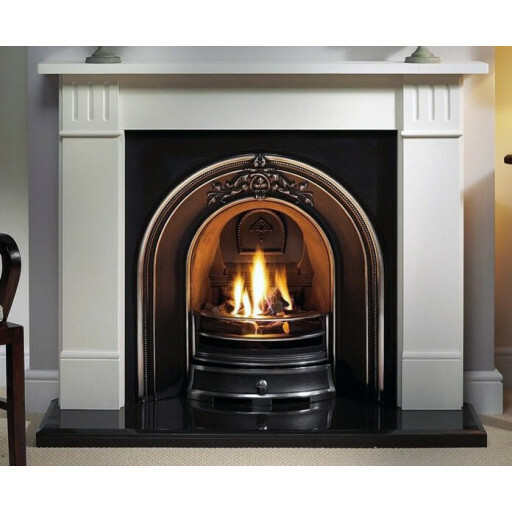 The 960 mm square/37 inch square standard size insert is usable with either the Legend Spirit or Legend Vantage cast back for gas fires, and electric and solid fuel options are available as well. The stunning looks of this fireplace insert will add a touch of class to your home regardless if you prefer a modern decor style or more traditional elements; it is extremely versatile and blends beautifully with either style. The Landsdowne Cast Iron Insert is constructed of the highest quality materials available for flawless use and durability and the cast-iron damper and backside lend themselves beautifully to the type of fuel that you prefer. Please note that the pictured hearth and fireplace are not included. Bought this cast insert for a period property we are renovating. Looks just like an original im so pleased.